We're listening to Play Music to Get Lucky? Google's perennial attempts to turn Google Play Music into a force against iTunes have been boosted by the arrival of 'I'm Feeling Lucky Radio' within the company's iOS app. 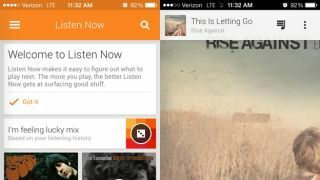 The random radio feature comes to iPhone, iPad and iPod touch two months after it was rolled into the Android version, while an iOS 7-inspired UI has also been introduced. The feature, like its search engine forebear, allows users to access a selection of music the app thinks they will like, auto-generating a radio station based on previous listening habits. The app will automatically bring tunes from the users most listened-to genre. The revamped iOS app also offers access to auto-generated playlists (such as Thumbs Up) for the first time and All Access subscribers will also have the opportunity to search genres within the app. The new Google Play Music features come into competition with Apple's own iTunes Radio platform, which is yet to launch outside the United States.